Ranch Tested and Cowboy Approved!! 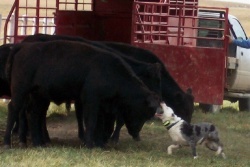 It is a Hangin' Tree Cowdog, raised and trained by Charlie Trayer. 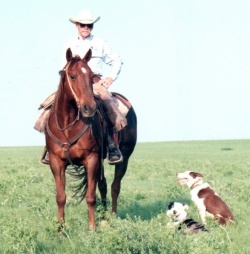 Charlie managed the Cottonwood Ranch in the Flint Hills of Kansas for 40 years, doing nearly all the work himself with the help of his Hangin' Tree Cowdogs and some good horses. Charlie has retired from the ranch now and lives in south Texas where he raises, trains and sells Hangin' Tree Cowdogs, “The Ultimate Cowboy's Dog”. 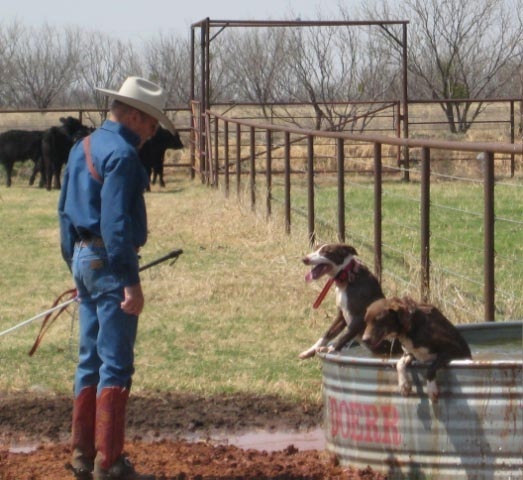 Charlie has placed working cowdogs on ranches all over the United States plus Canada and offers clinics with his methods geared specifically for working cattle with dogs. 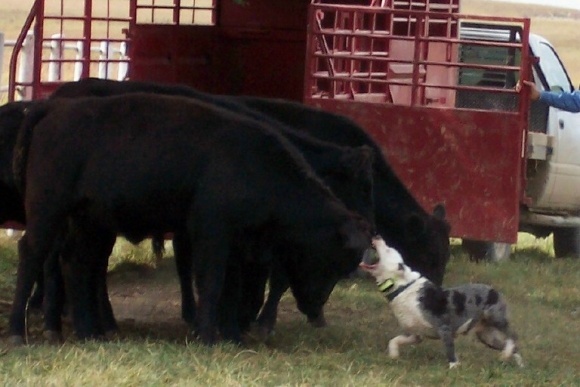 Charlie also gives cowdog demonstrations during equine educational events, rodeos, cattle seminars, and other ranch, cattle, and working dog related gatherings. When Charlie first started using the dogs, no one could believe that one man and a few dogs could gather and pen large herds, 100 to 500 head of yearling cattle. But from the first gather years ago until this day Charlie and his dogs have been successful. 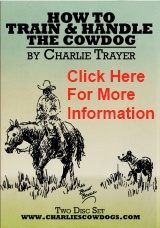 Craig Jensen says, "When it comes to breeding and training Hangin' Tree Cowdogs, Charlie Trayer is at the top of the list." And John Jacot tells us, ".......He knows what it’s like to put long days in the saddle gathering range cattle. He knows what kind of dog it takes to be there at the end of a long day. Charlie knows what kind of dog a cowboy needs. I highly recommend Charlie Trayer."